1. What is your preferred seam style for a tarp ridge line? I'm considering either a flat-felled or flat-felled/french hybrid. 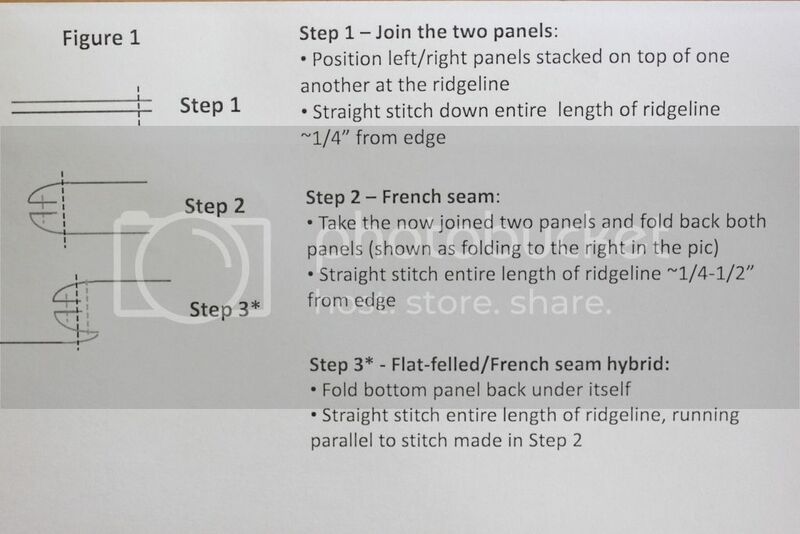 I don't know enough about how the grosgrain-reinforced ridgelines work, but if there is a big advantage to those, could someone walk me through how one goes together? Since we all like pictures, here is what I am considering. 2. 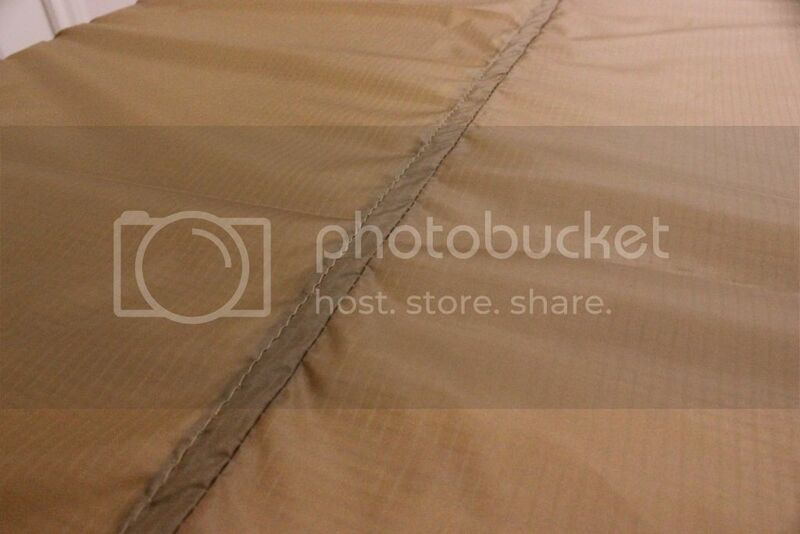 Is it important which side of the seam is placed on the outside of the tarp? 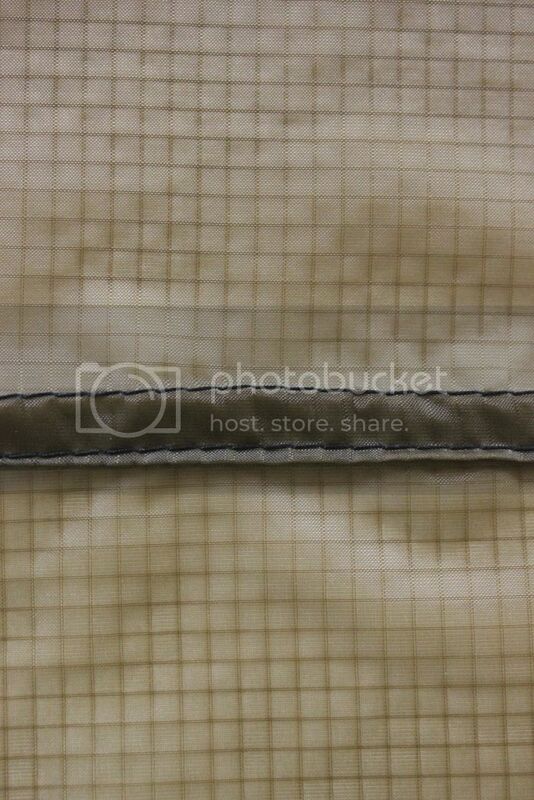 I usually see the side that has the 2 visible stitch lines on the outside of the tarp, but I'm wondering if it matters. I could see that on the flat-felled/french hybrid seam, it might be difficult to effectively seam seal the side with the 2 visible stitch lines because of the pronounced lip. 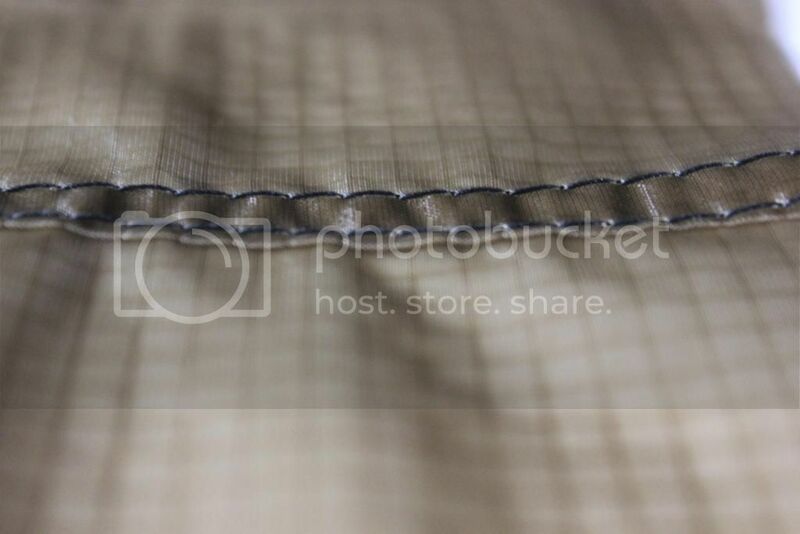 You would not only have to seal the stitch lines, but also make sure you get enough sealant in and along the lip to keep water from getting under the folds. This is the lip on a traditional flat-felled seam (similar in size on both front and back). 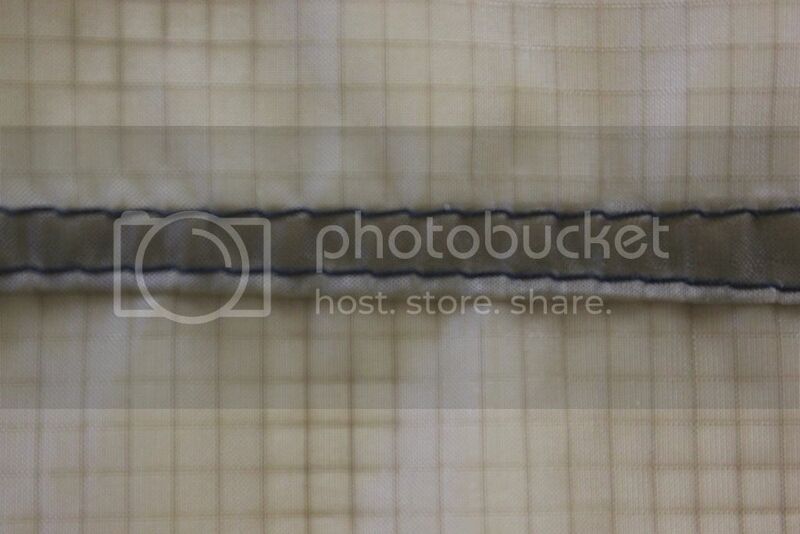 And this is the lip on the Hybrid seam (much more pronounced on the side with 2 visible stitch lines). 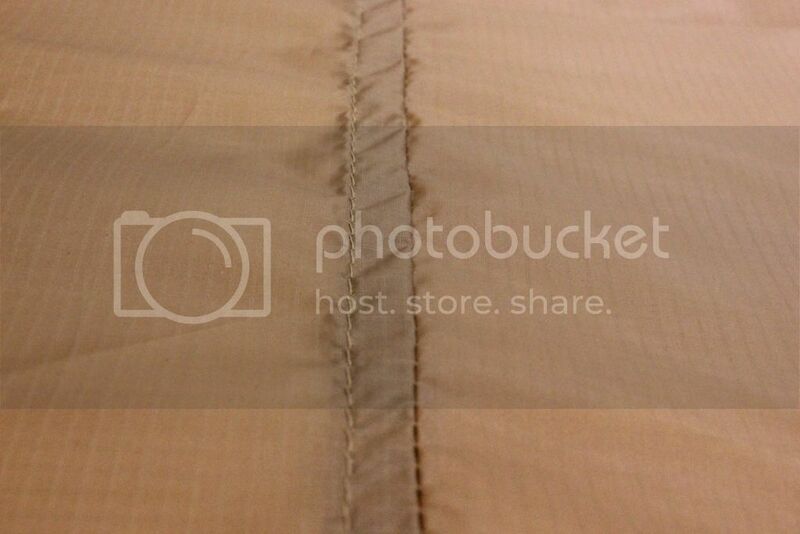 Seems like this would be a pain to seam-seal. 3. Do you typically seal the inside or outside of the ridgeline seam? 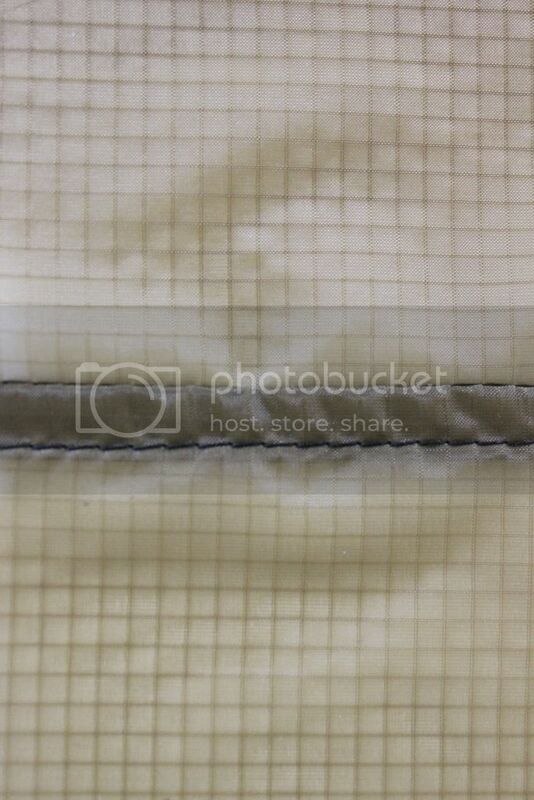 Doing the inside would look the best and still keep you dry, but it would not prevent the stitching from wetting out. I imagine the constant wetting/drying of the stitches would decrease the life of the stitch, making a top seam seal more desirable. True? 4. Does anyone go through the trouble of masking off the seam before applying sealant? I'm a little OCD when it comes to stuff like this and am not going to like the look of glossy sealant just slopped along the seam, especially if it's going to be visible from the outside. I realize that it's going to be out in the middle of the woods and nobody will ever see it, but I'd like it to have a professional look when it's all done. Hey Spaceman. First off let me say your stitching is very nice. The flat felled or hybrid is equally good to use and both are strong. 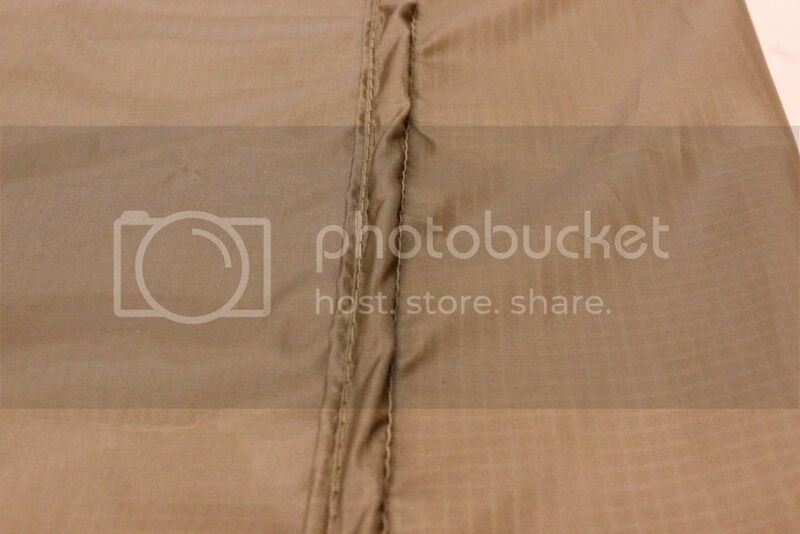 Either way the seam is, is good, but make sure to seam seal both sides. I personally don't like to use them (flat felled) as its hard for me to manhandle 12 or 13 ft of material in a small space. I use the grosgrain method as its simpler for me to sew. 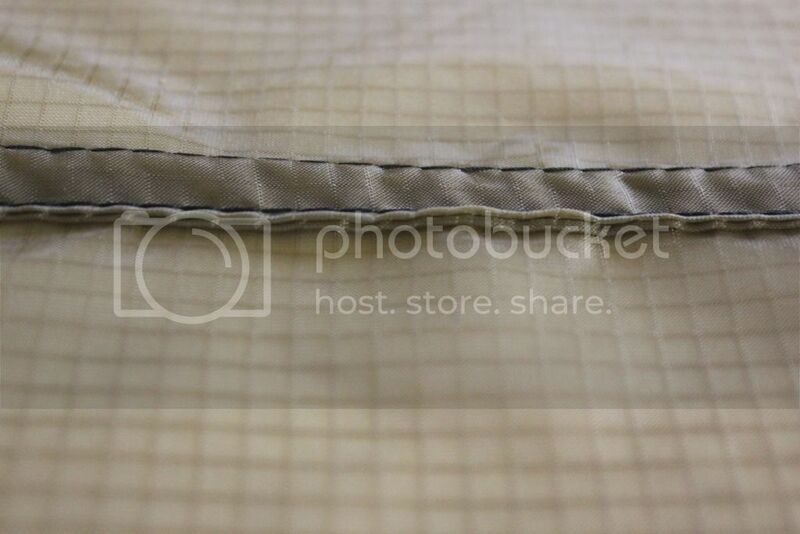 Seam sealing - on the "other" forum, I have gotten into arguments for saying that I seam seal both the inside and outside. Some say just the inside is good enough. I do both as I can be sure there will be no leaks. Unless the tarp material is PU coated, I use mineral spirits and 100% silicone - the cheapest I can find as long as its clear. I mix the 2 till its like thin syrup and brush it on with a small parts brush. Never had to use masking - the thin layer shouldn't run. I just hang the tarp up real tight on the ridgeline and paint the outside, let dry, flip it and then paint the inside. Thanks, V_Allen. I was hoping nobody would scrutinize the stitching as it was done really quick without any tension adjustments just so I could get some photos. I'm still trying to dial it in for the new SilPoly but am getting more puckering than I would like. It worked pretty well on this fabric though. For the grosgrain cap, I'm assuming it just sticks up in the air for most of the length of the ridgeline except where it gets sewed down under the end reinforcements? Yeah, getting the tension right with the silpoly is different due to how slick and thin it is. I crank down on the foot tension a bit and use a slightly higher top tension. I only guide the silpoly thru, neither pulling or pushing. If I pull it, it puckers like crazy. I use an ancient Singer 201-2 that I rebuilt. I only use Gutermann Mara 70 thread for tarps and hammocks. Its very consistent. 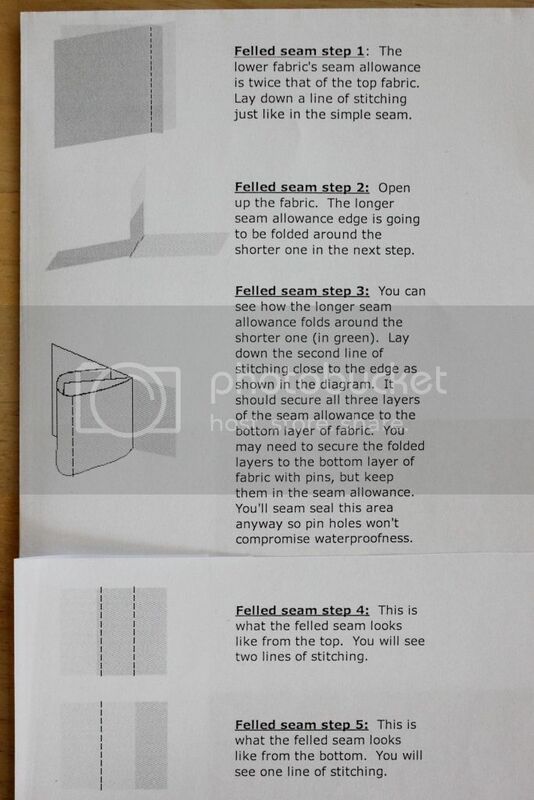 I prefer the flat felled seam as you only have to stitch two lines instead of 3. I also have a foot for my viking machine that helps keep the seam overlap consistent. I just line it up and let a rip! I also find IMHO that the flat felled seam when sewn with correct tension lies flatter and cosmetically looks better. But yea either will do the job, use the one you like best. just to chime in about sealing one or both sides...after reading a few articles about plumbing, some loving teflon tape, others praising the liquid teflon, some liked using both and others said both was overkill...I asked a plumber. He said he used both, looked at me and asked, if it doesn't leak, then is it really overkill? I think it comes down to what you're comfortable with. Seal one or both sides. As long as you stay dry, it doesn't matter what anyone else thinks. Well, for Tarp v1.0, I decided to give the flat-felled/french hybrid a try. It didn't come out as well as my trial runs, so I'll definitely be flipping it over so the "back" of the felled seam is on the outside of the tarp. That side came out ok. Things went a little off the rails on the felled side and I wound up with bunches of fabric between the two stitch lines. I think it started out ok, but it became hard to keep everything lined up and tensioned correctly as I made my way down the ridgeline. This is what I'll be hiding on the inside of the tarp. 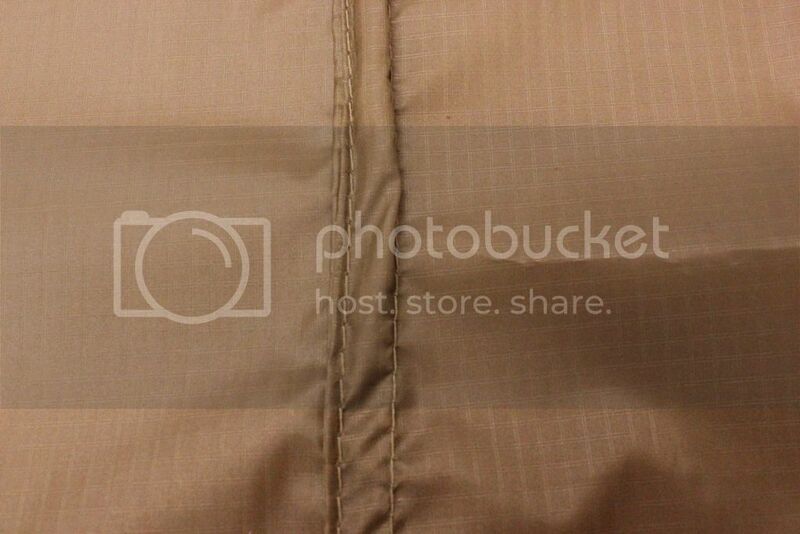 For this tarp, I'm going to try sealing just the outside/topside and see what happens. 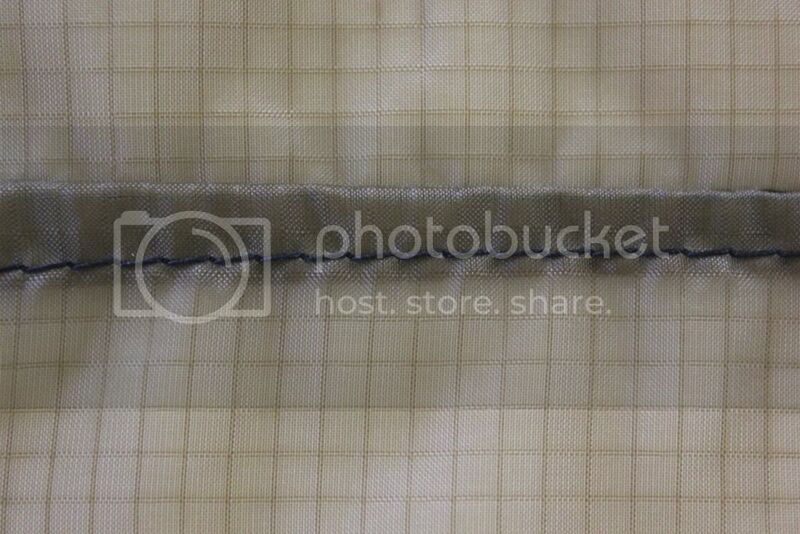 I may try the plain flat-felled seam next time, but the grosgrain method is looking more appealing.